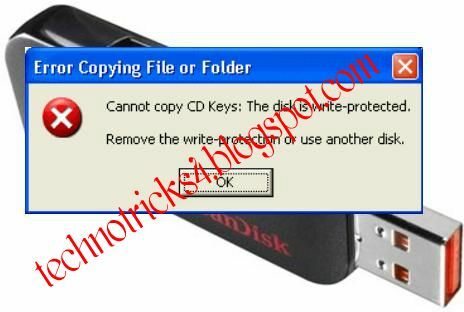 One of our readers has asked for this solution and hence as the post title says we will be trying to fix a very common error faced by many USB Drive users. This post includes four different solution sets for removing the write protection error for USB drives or simply pendrives. 1. Make sure the write-protection latch of your drive (if it has any) is turned off. 2. If you are using an updated antivirus, try scanning the drive for viruses. There are many solutions to this problem and actually every one of them may have worked for some users but may not work for you. Hence I’m trying to enlist all the feasible solutions, so if one doesn’t work, try the other one. Press Winkey + R (or just open the Run from Start menu). Type regedit and hit enter. Go to HKEY_LOCAL_MACHINE\SYSTEM\CurrentControlSet\Control\StorageDevicePoliciesNOTE : If this is not there, you may need to add this entry. For that download the batch file add.bat from here, and double-click the file. The entry will be added to registry. Now in the right pane double-click the key WriteProtect. Now set the Value Data to 0 (zero) and press OK.
Exit Registry and restart your PC. Now try using your USB Drive. As the solution suggests we will be formatting the USB drive, so backup all the items in the drive first before carrying out htis step. Unzip the pack to a folder. Now double-click the Start.bat file in that folder. This will initiate the formatting. Wait until the formatting completes or the LED of the drive stops blinking. If you fail once give it few more try. Now remove the pen-drive and plug it in to the PC again. Now, open RUN and type cmd and hit Enter. Now in the command prompt, type CHKDSK [usb-drive-letter]: /F. That’s it. You are done. This is yet another solution which will try to solve the problem by using a low-level format. Don’t forget to backup your drive items. Download the free utility HDD Low Level Format Tool. Now using it, perform a low-level format of your USB drive. If you fail once give it few more try. Now open RUN and type diskmgmt.msc, hit Enter. Now right-click the USB Drive and press Format. Now do as shown in the screenshot below. Then press OK. Transcend has its own Recovery Tool to get rid of this error. Go to the Transcend Product Support Page. Enter your Model No. of your USB Drive, hit Enter. Now select the product which which is most similar to yours from search results. Download the mFormat utility. If you are asked for serial no. enter your product serial no. or if you don’t have it enter this number: 1456784523. Plug-in your drive and run the utility to format your drive. You may need to try this method several times to fix the error. Well as I said earlier that every single trick among all those listed above have solved the problem for many and has not for many others. Lets hope one of these will help you out of the “Write-protection” error. If you fail, feel free to ask. But if you succeed, please let us know which one worked for you, so that our future readers get a share of your valuable experience. Also, if you feel you have a better idea, let me know via comments.